Usually I start my layouts with a photo and then search my voluminous collection of papers for ones with the right "feel" or colours, but for this page I began with the background paper (from the Epiphany collection by Prima). I knew I wanted to use a monochromatic colour palette so I chose a photo I thought would look good in black and white. 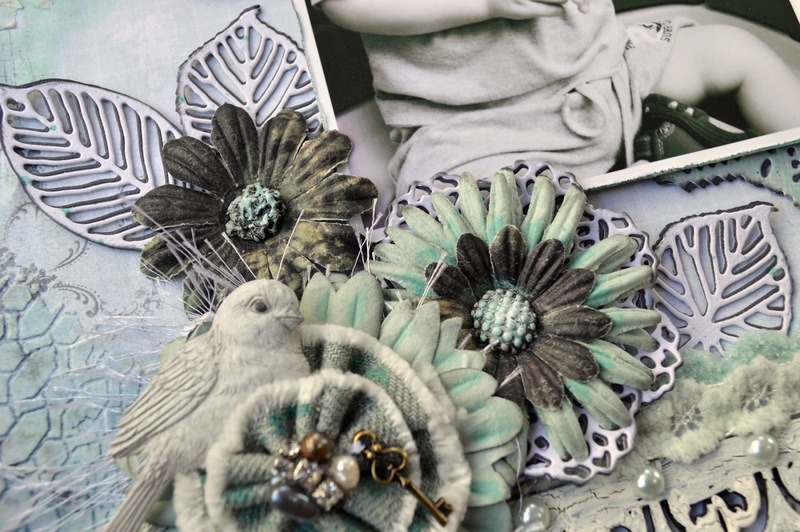 Then I searched my stash of flowers and other embellishments for items that worked well with the soft aqua colour of the paper. 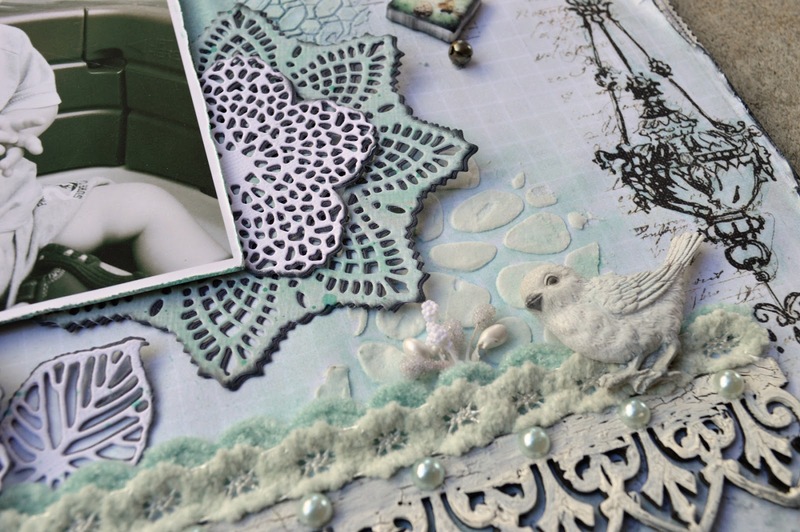 I ended up using a lot of old Prima stuff: all the flowers , the little tile, the resin birds and even the aqua paper I used for the doily (reaching way back in my stash from the Cavalier collection). 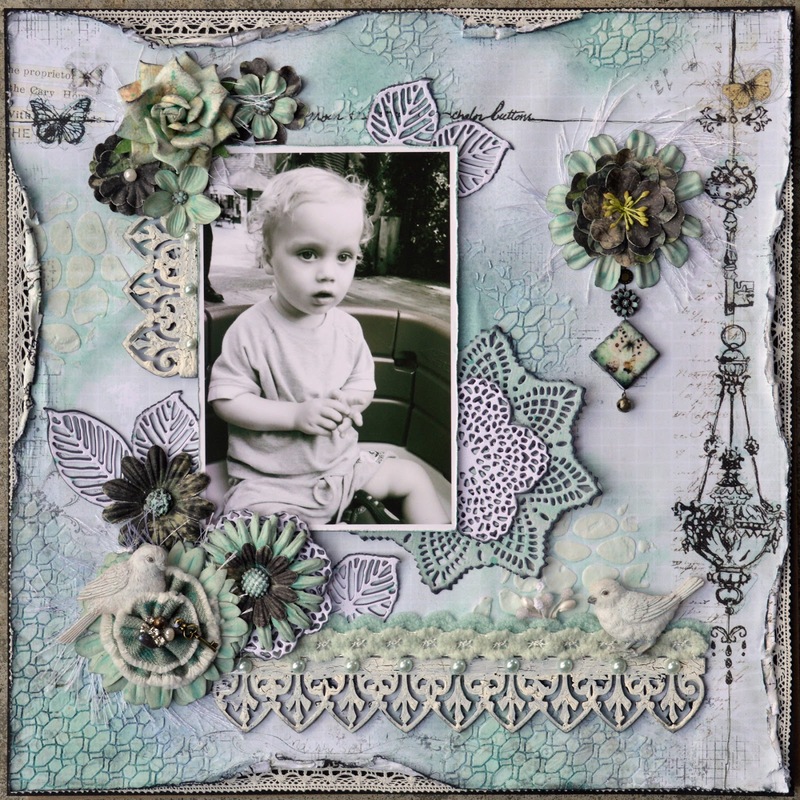 So I thought I might as well use some of the new Prima dies too. I'm the perfect evidence that those design teams really work because when I see what gorgeous things other people do with those products, I just have to buy them (I blame Jrabs for making me purchase those dies, lol. You can find her blog here http://scrap-escape.blogspot.com/ ). As usual, I layered each die-cut with a darker one underneath. 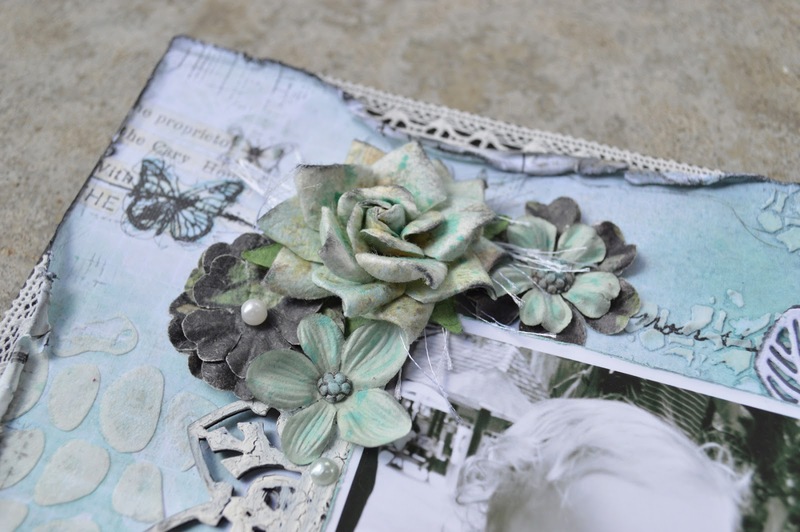 I wanted to add some texture so I used molding paste and a pebble stencil, then sprayed it with turquoise mist. 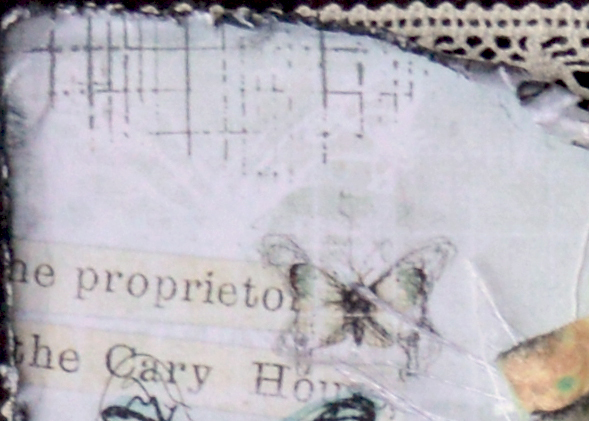 Then I did some random stamping with a grid stamp and dark grey ink. Along the bottom I used another stamp that was too heavy looking so to hide it I did some more stencilling with molding paste over top and other random areas. I then misted it with turquoise and grey coloured mists, dabbing off the excess. I also painted and splattered some of the turquoise mist onto the flowers because their colour now seemed too faded against the brighter misted background. The threadlike string under some of the larger flowers was done by wrapping some "hairy" white yarn around my fingers into a loose circle before gluing the flower on top. 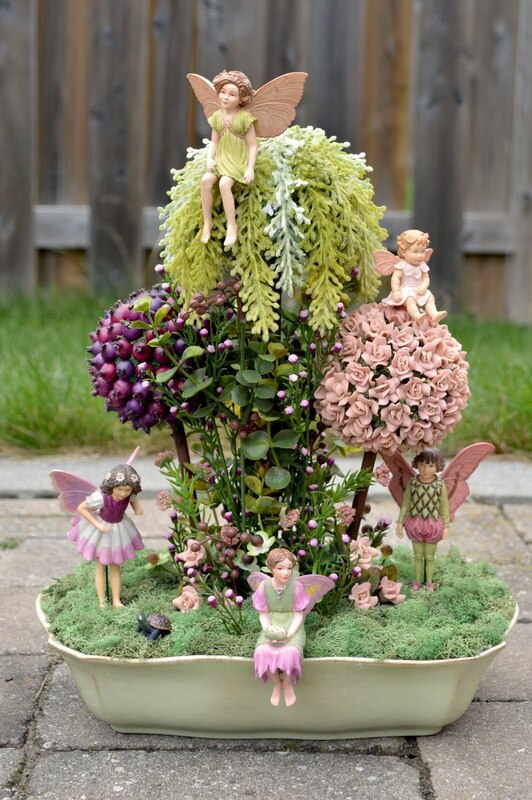 The textured flower centers were made from polymer clay using a mold, then painted. Once again I tried doing a crackle paint finish on the chipboard border using a layer of Elmer's Glue All between paint colours (black and white). This time I applied the glue rather thickly and dried it for a minute with my heat gun before applying the topcoat of white. 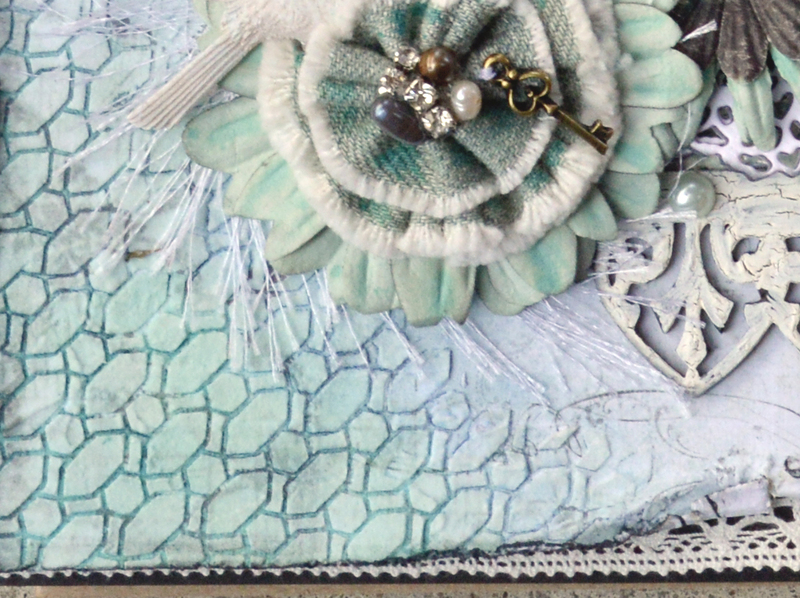 I finished by distressing the edges of the paper and adding some lace trim around the edges of the black backing paper. Thanks so much for visiting (the one or 2 or you who may be reading this, lol). Hi Tracy! I'm almost speechless! This is SO SO SO artistic! WOW! I love the colors and all of the techniques you used! Super fabulous! So gorgeous!